Students have several methods of engaging in various research opportunities on campus. The Natural Sciences and Engineering Research Council (NSERC) of Canada provides USRA awards for undergraduate students to engage in research on University campuses. These assistantships are available to students during summer terms. These are competitive positions. Environmental Science students that are applying to take up an USRA at Western should apply through the Department where their supervisor of interest is located. Each department will have different deadlines so it's important to inquire early in the academic year. For further information about NSERC USRAs please go to their website. This is a course-based research opportunity that student registered in a Major or Specialization module in Environmental Science. More about the Independent Study project course. This is a course-based research opportunity that student registered in an Honors Specialization module in Environmental Science. Many students gain valuable experience and skills taking part in volunteer opportunities on and off-campus. Some students choose to volunteer in research labs by discussing possibilities with faculty whose research is of interest to them. Other resources for finding volunteer positions can be found on the Student Success Centre website. The Science Internship program is and 8-16 month paid career-related placement open to eligible 3rd year students. Students will receive valuable hands-on work experience in a professional environment related to their field of study. Science internships are paid positions. Students sign up at the start of their 3rd year and enroll in a preparatory class if determined eligible for an internship. Students must return for Year 4 of their program. In the fall of your 3rd year you will register for Science 3391: Internship: Planning, Practicum and Prospects, which is a 1.0 credit course taken on top of your regular course load. Students complete this course work in addition to completing the internship for this credit to be granted. This credit cannot be counted towards module requirements. I completed a 16-month internship placement with Environment Canada at the Canada Centre for Inland Waters located in Burlington, Ontario, from May 2012 to August 2013. The Canada Centre for Inland Waters has staff from Environment Canada’s Water Science and Technology Directorate as well as members of the Department of Fisheries and Oceans, and is Canada's largest freshwater research facility. During my placement under the Aquatic Ecosystem Management Research Division my work focused on freshwater quality research including source water integrity and algal and cyanobacterial species outbreaks, blooms, and toxins, just to name a few. 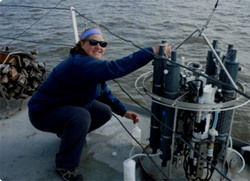 Through the internship I built on lab and field techniques and had the opportunity to learn a great deal about limnology. My placement at Environment Canada included fieldwork in both Southern and Northwestern Ontario, as well as Manitoba, including several weeks on board research vessels on some of Canada’s Great Lakes. I was able to improve my interpersonal and teamwork skills through collaboration work with different research groups. I am grateful for the experience to be a part of research that is both in the environmental science field and closely related to my future career goals. The internship opened up doors for future educational opportunities as well as future employment. After having worked 12 months of my placement I came to realize that this is a career I would love to pursue. In addition, having this experience on my resume will help me stand out to future employers. I thoroughly enjoyed my placement and would recommend the Science Internship Program to all eligible students! For further information about the Science Internship program click here. Western’s Work Study program offers an opportunity for students to work part-time on campus in jobs that accommodate their studies. The objectives of the Work Study program are: to assist students in financial need with a regular source of income that does not add to their debt load, offer students training and experience that will assist them in further studies and their eventual entrance into the workforce, and to help staff and faculty. Financial need is determined in a manner similar to the Canada and Ontario Student Loans assessment. It involves assessing the costs of the program the student is registered in, based on advice from our students, and the resources available to them.